Article first published in Inside Time by Erwin James on 31 May 2018. 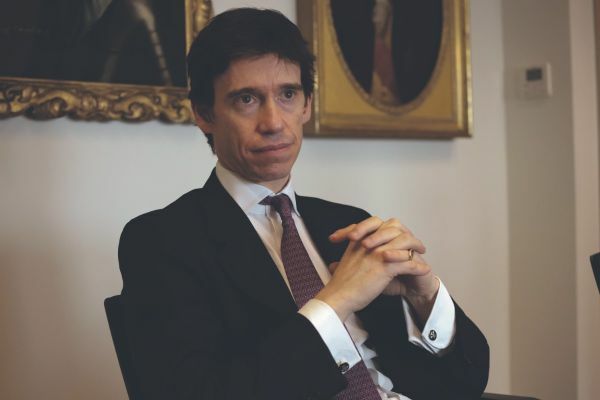 “What I’m trying to work out is what it is that makes one prison, for example Altcourse, work well, and another prison – not too far away – not work well,” says Prisons Minister Rory Stewart when we meet at MoJ headquarters to discuss his policies and vision for the prison system for which he now has responsibility. The Minister, formerly Minister for Africa, has perhaps one of the most colourful career paths of anyone who has ever held his current office, including a two year walking odyssey through rural districts of Pakistan, Iran, Afghanistan, India and Nepal, (a journey totalling around 6,000 miles which he began in 2000) – and a period of governance in Southern Iraq following the coalition invasion in 2003. In 2004 he was in command of his compound in Nasiriyah when it was besieged by Sadrist militia and was later awarded an OBE for his services. A best-selling author, his book about his time in Afghanistan, ‘The Places in Between’ was a New York Times best-seller described by the newspaper as a “flat-out masterpiece”. He is currently the MP for Penrith and the Border. In the flesh he looks too young to have lived through such drama and adventure. “I’m ten years younger than my predecessor,” he says smiling. I guess it’s true what they say about getting older; policemen and government ministers all just look so young. The first thing I want to say to him is ‘please try and sort out prison food’. While there are some establishments that provide sufficient nutrition in healthy portions, and understand the value of keeping incarcerated human beings well fed, there are many others that fail miserably in the servery department. I tell him about Lucy Vincent, a 20-something young woman who is campaigning through her website Food Behind Bars for the government to provide good nutritious meals for all prisoners, regardless of the institution. “Thank you,” he says, and notes down my comments. “I don’t think there are any easy recipes for success. Its about relationships between prison officers and prisoners”. Secondly, I remind him of what President of the PGA Andrea Albutt said about the outsourcing of prison maintenance contracts following the collapse of the construction company Carillion. She said the services should be handed back to the works departments so that the governor has instant control of where and what needs to be done. “But when it’s done properly there is no reason why outsourcing shouldn’t work well,” he says. “I agree with him, there were serious problems with that contract.” But I remember as a prisoner that working with a works officer was a way for prisoners to learn skills, or even utilise skills they had before coming to prison. “Sure, sure,” he says, “I’m very, very much in agreement with you there. I’m very keen to get many more prisoners employed. I was talking to a prisoner recently, a qualified electrician, and he’s very rare. He’s employed by the prison to use his skills. But so often, Governors are not taking advantage of the skills available in the prisoner population.” Would he like to see Governors actually taking advantage of the skills and abilities of prisoners in their charge? “Much more. Much more,” he says emphatically. But traditionally, prisoners are not seen as assets. Does he want to change that? My view, from the 20 years I spent in various prisons from Cat A to Cat D is that prisons can be places where good things happen, not just places of shame and neglect. I believe a prison should be seen by society as a valuable community resource, as valuable as a hospital or a school. So why don’t we do that? I think that it’s because politicians and the media have famously used prisons and prisoners as whipping boys for the electorate. I well remember former Justice Secretary Chris Grayling announcing when he took on the role that prisons under his watch were, “no longer going to be Holiday Camps.” One of the most disingenuous utterances from someone in his position that I could remember. “One of the things I’m interested in is what can we do to get a bit of consistency, some sense that you can expect the same basic things whichever prison you are in”. ‘Compared to wallowing in the mire of wasted time and chaos that defines much of our prison system’, I said – that sounds like absolute luxury.